LED lights are now widely used in recessed lighting as a featured light source that offers many advantages and is available in almost all types and styles of bulbs. You can install LED recessed lights in your home to reduce the consumed energy by 80% or more and get many benefits which LEDs provide such as the longest lifetime, a variety of color temperatures, cooler operating temperatures. LED bulbs benefits make sense to convert any existing incandescent, halogen or CFL (compact fluorescent light) recessed light to LED or directly installing LED lights during new construction projects. 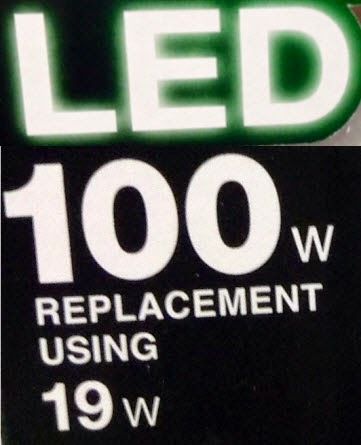 If you decide to go with LED, you may ask for the LED bulb wattage that is equivalent to your incandescent, halogen or CFL (compact fluorescent light) bulb when upgrading to LED lighting. The below table will help you to choose the equivalent wattage of the LED bulb when calculating how many recessed lights is required to light a room or space. Note: all the values are represented by Watt. This table represents a general guidelines, since there are a variety of manufactures, actual specifications may differ for each specific manufacturer. It is better to check your product specifications for a more accurate information. Finaly as you see LED bulbs is the most efficient light source, but you should consider most of the LED lights focus their light output to a specific beam angle rather than 360 degrees, so, it is recommended for downlight recessed lighting.